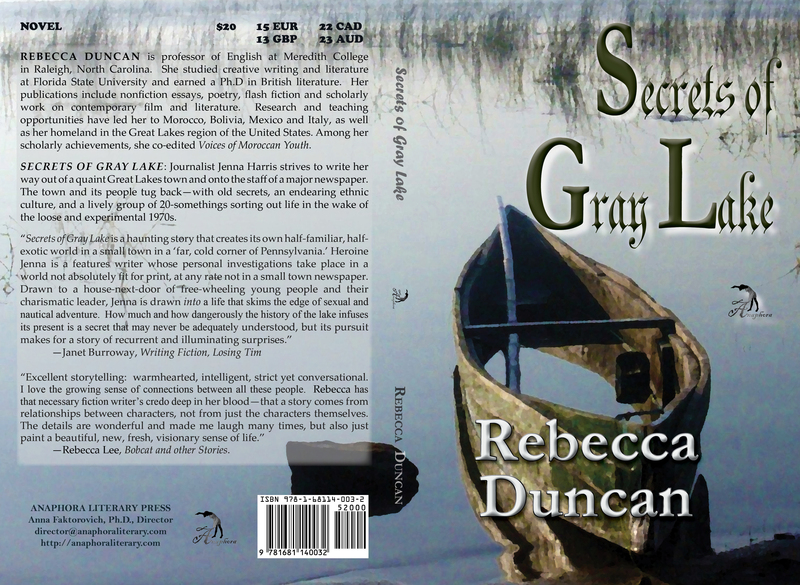 Secrets of Gray Lake: ($20, 190pp, 6X9″, Print ISBN: 978-1-68114-003-2, Hardcover ISBN: 978-1-68114-112-1, EBook ISBN: 978-1-68114-028-5, LCCN: 2014922510, May 2015; Purchase on Amazon or Barnes and Noble): Journalist Jenna Harris strives to write her way out of a quaint Great Lakes town and onto the staff of a major newspaper. The town and its people tug back—with old secrets, an endearing ethnic culture, and a lively group of 20-somethings sorting out life in the wake of the loose and experimental 1970s. “Excellent storytelling: warmhearted, intelligent, strict yet conversational. I love the growing sense of connections between all these people. Rebecca has that necessary fiction writer’s credo deep in her blood—that a story comes from relationships between characters, not from just the characters themselves. The details are wonderful and made me laugh many times, but also just paint a beautiful, new, fresh, visionary sense of life.” —Rebecca Lee, author of Bobcat and other Stories. Rebecca Duncan is professor of English at Meredith College in Raleigh, North Carolina. She studied creative writing and literature at Florida State University and earned a Ph.D in British literature. Her publications include nonfiction essays, poetry, flash fiction and scholarly work on contemporary film and literature. Research and teaching opportunities have led her to Morocco, Bolivia, Mexico and Italy, as well as her homeland in the Great Lakes region of the United States. Among her scholarly achievements, she co-edited Voices of Moroccan Youth.